Nostalgia. The Death of Minimalism. Well, it’s Tuesday. Fall is peaking around the corner deciding whether to allow summer a few more minutes or if it should usher itself in. Whichever the case, I’m cold and bundled up on my couch with a quirky yet stylish crocheted cap and my 1970’s vintage crocheted throw that someone in my family made. It’s a beautiful thing. Until it wreaks havoc on your minimalism. My family is a family of hoarders. Not so bad that we should be featured on a TV show, but bad enough that is it thoroughly thwarting all of my minimalistic ponderings. And, it’s not that we are hoarding new stuff. We’re hoarding OLD stuff from people long sense gone from this earth. Nostalgia is a speed bump on my minimalist journey. But, I like my dishes. I really do. Some are from my grandmother. Some are from my uncle — her brother, in fact. Why are we not allowed to use our stuff? I have what you would refer to as Let’s-save-this-and-use-it-one-day-special syndrome. Are you inflicted with this terrible condition affecting wanna-be minimalists everywhere? 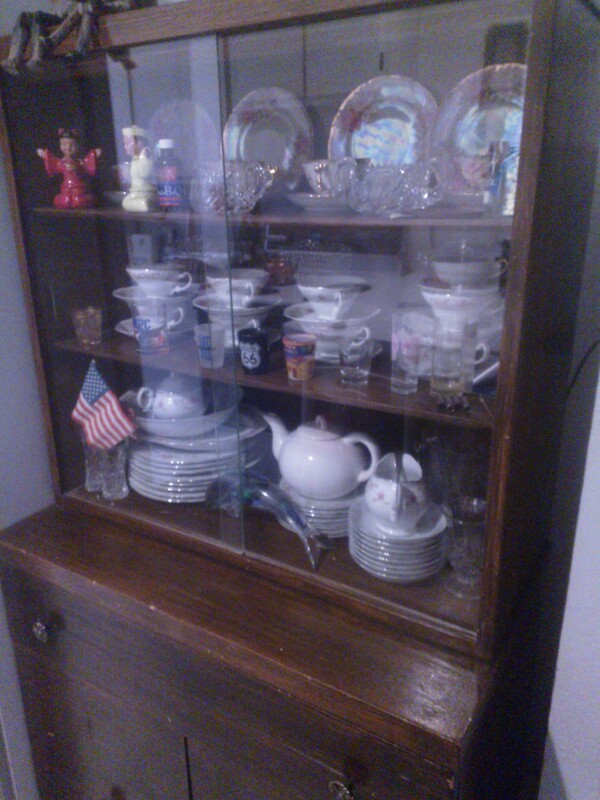 ~Having an entire china cabinet full of 100-year-old dishes that you only wash, use and rewash one day a year. ~Boxes of clothes from Aunt Rita’s 1960’s wardrobe that may come back in style one day if the mice, moths and other creepy crawlers don’t eat them first. ~Bags of your great-grandmothers quilts hidden in your closet that no one ever gets to see. ~Keep them. On the shelf. Protected by glass. ~Bust them to bits and mosaic something I love with all the pieces creating art and a new treasure. ~Wash them and use them as our every-day dishes. ~Continue to ignore them and not let this bother me anymore. Right now I’m going with #4. But, only until the rest of the family gets home so we can have a minimalism intervention. Sometimes I feel like I’m the only one on this minimalist journey! Minimalism isn’t about just me; it’s about everyone else in my house, too. Treasures? Or, what God considers junk? Simple living isn’t just a fad. It’s real. And, it’s growing. And, if it’s in you, you have it for all eternity. So, on that note, let’s get rid of some stuff! Yet again I have forged ahead into donation zone. But, now it seems I’m at a deeper level. Now instead of things I don’t like or need, it’s the very items that I’ve been keeping for 20 years that God is getting rid of. And, I’m letting Him do it. And, it’s refreshing. My stuff shouldn’t control me. I should control my stuff. So, when He says to get rid of it, I then add it to the pile. All these beautiful candle holders, lamps, clothes…all things I thought I needed, have now been added to the donation pile. I’ve also noticed that the more stuff I have, the more time I spend taking care of it. The less stuff I have, the fewer worries I have to go along with it. So, I shall store up for myself treasures in heaven, and let these worldly possessions go. God bless’em! Thank you, God, for Your clarity, Your judgment, and Your divine love. It’s been a long time since we chatted. Little Girl started school, and I am so blessed to have such a fun and smart kindergartener. I know I’m biased, but one day I will be able to share more about our adoption story and actually get to tell you some details. That day is coming soon, PRAISE GOD! As soon as I can share, I will. If you’d like a sneak peek into our now princess-pink world, check out a post from the archives — 8 Things I’ve Learned From a 4 year old. Today I want to chat with you about stuff. That dreaded five-letter word that sends minimalist packing their bare necessities and heading for the hills. 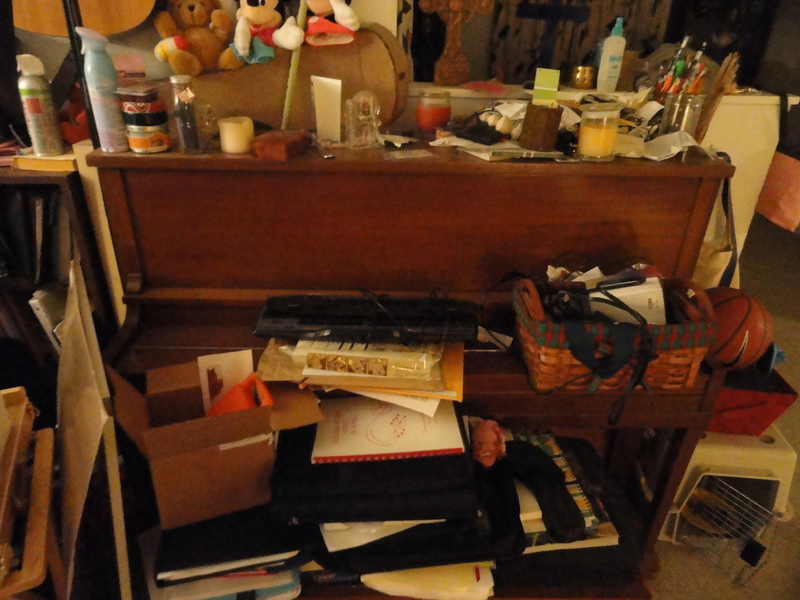 I noticed this summer just how very much stuff we have….and, how hard it is to get rid of it. I have problems getting rid of stuff. I will admit it. I’m not scared to share my minimalism struggles. This isn’t easy. I am attached to my stuff. Are you? For today, let’s be honest. I will make it as easy and straightforward as I can. And, then I will read it myself and go do it! HA! a. Great Aunt Sarah will die one day and this will be our memory. b. It’s uglier than sin and doesn’t match anything we own, but….see Letter A.
I know it’s hard. Step #1 might as well be a 400-foot hurdle. But, as much as I love my family and friends, if I absolutely do not love the item they gave me, I must get it out of our home. We don’t have room for extraneous gifts. I’ve noticed that there is so much extra stuff in our home that I’m embarrassed to have people over. Instead of hoarding other people’s stuff for them, why not hoard time with them? Box it up. Donate it. Recycle it. Give it to someone else to hoard…I mean love it. Allow yourself to let it go. Put it in the car. But, don’t just leave it in your trunk to ride around with you. I know this from experience. 3. Don’t get more stuff. As soon as I get rid of stuff, more stuff seems to appear. Whether it’s good-hearted friends passing it along or simply a great bargain, please use self control and mindfulness before bringing new items into your home. Will I die without it? Is it something I’ve always wanted? Of course we all like new things. We love bargains. It’s okay to bring items into your home. But, if you don’t have a place for it, let it go. Or, let something else go to allow your new treasure the space it needs to be loved and cherished. Your new item deserves that. I hope this has helped you take the next step to minimalism. Like I’ve said, minimalism isn’t getting rid of the things you love, it’s getting rid of the things you don’t. Don’t be held hostage by your possessions today. I’ve been on my so-called minimalist journey for over 140 posts now. As I post, I’m continuously insprired by others who are on this minimalist journey. I couldn’t make it without their wisdom, encouragement and constant inspiration. But, I have too much stuff still. Does that make me a minimalist? But, wanting a minimalist mindset and lifestyle does. So I will persevere. Treading deeper and deeper into these simple living, minimalist waters that others have so bravely mapped out for me. But, it’s hard. It’s still hard to get rid of my stuff. The things I may wear someday. That dress that I really want to fit into now, but I don’t. The cute figurines. The flirty tops, and the ever present trinkets that are clouding my life. It’s time to let them go, again. I want freedom and joy. If it doesn’t bring you joy, get it of your house NOW. Be particular about your stuff. Does it make you happy? Does it remind you of your favorite vacation or your most beloved aunt. Then keep it without regrets. I’ve noticed this about myself. But, now I’m harsh. If I don’t absolutely love it, it must go. I must make room for sanity and for the things I DO love. Could someone else use it right now? If I only use it once a year, but someone else would use it everyday, then why am I keeping it to myself and letting it collect dust? Maybe my friend I give it to will allow me to use it that one time I need it? Now that’s a deal. It now serves it’s intended purpose, allows me to declutter my world, and creates much needed community. Recycle it, Re-use it, or get rid of it. Nuff said. There are plenty of ways to get rid of our stuff. The curb (not for trash but for other’s to pick up. Ex. TV’s and old grills.). A non-profit organization’s thrift store. A food pantry’s clothes closet. Your neighbors, friends and family. Or, even online with Craiglist and Freecycle. Allow your stuff to be a blessing to someone. It’s freeing and good for the soul. Don’t allow others generosity to create more stuff and clutter. Family and friends are a valuable resource when you don’t want to spend money on clothes. And, recently, my dear friends weight loss has blessed me with a fabulous new wardrobe. All FREE! But, I don’t need all of it. Or, it created duplicate pieces. (How many black shirts do I really need?) Pass along any blessings to others. And, congratulate your friend on his/her weight loss triumph! As I read these four things, I am again inspired to clean. LOL Praise God for that! I’m going through Little Girl clothes right now. God has truly blessed us. Not only with a great little girl, but with friends and family who continuously supply us with cute clothes in all sizes. God is a God of abundance. That’s for sure. Be blessed, joy-filled and FREE! This quote was posted recently on BecomingMinimalist.com. I haven’t seen a quote by Peace Pilgrim online lately –maybe not at all. I was pleased to see it. Ms. Pilgrim is a true testament of God’s love and mission. A minimalist. A lover of people. I truster of God. And, in her few words, she said it all. We serve God or money. I also translate money as “stuff.” Money buys stuff, right? When we are weighted down by our stuff we can’t live. It becomes baggage: Physical, emotional, and spiritual. We have to get rid of our stuff. So the other day, I straightened up our living room to find one of our cats had pooped — yes, pooped — on a stack of papers I was “storing” on top of our ottoman. Thanks, guys. But, you know what? I evidently didn’t need any of the pooped-stained papers since I threw them all away. And, I took it quite literally to mean that I need to get my poop together. I am a “storer” of stuff. Embarrassingly keeping papers that I never need because I may need them one day. I am getting rid of stuff. Ruthlessly. Cold-hearted elimination of stuff. It is the only thing left to do. We have to be ruthless. If not, the stuff creeps back into our lives. It slithers back into our closets, our worlds. It weighs us down and owns us, not the other way around. Today, be ruthless. Be cold hearted. What is one thing that you are holding on to that is owning YOU and weighing you down? Donate it. Trash it. Get rid of it. Whatever you need to do for freedom, do it. It is your life. Own it.